The condition of the within written Recognizance is such, That Whereas Henry Westerby alias Yorky this day charged before me a Justice of the Peace within mentioned, for that he the said Henry Westerby alias Yorkie was the Seventeenth day of October 1854 at Ballarat in the Colony aforesaid, did with other persons riotously and tumultuously assemble, and did then and there, feloniously burn, pull down and destroy the dwelling of one James Bentley it therefore be the said John Dougherty shall appear at the Supreme Court of Criminal Sessions to be holden at Melbourne in and for the Colony of Victoria, on the fifteenth day of November A.D., 1854, and there give such evidence as he knoweth upon an information to be then and there preferred against the said Henry Westerby alias Yorkey for the offence aforesaid, as the Jurors who shall pass upon the trial of the said Henry Westerby alias Yorkey then the said Recognizance to be void or else stand in full force and virtue. 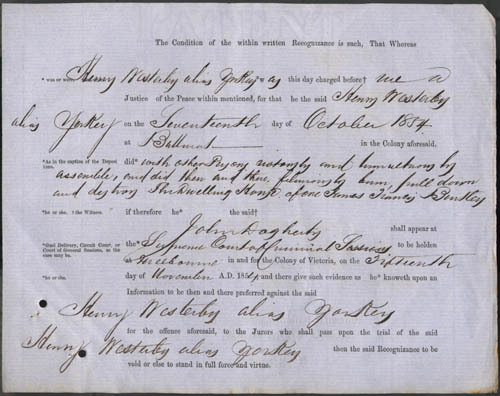 Henry Westerby was born in 1814 at Yorkshire, England. At the age of 40 he sailed to Australia on the Derry Castle, arriving in 1853. 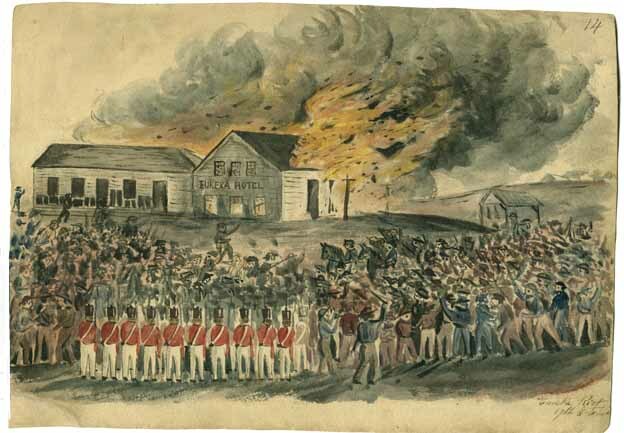 The men accused of destroying the Eureka Hotel, Henry Westerby, Thomas Fletcher and Andrew McIntyre, were convicted and sentenced to gaol on 20 November 1854. 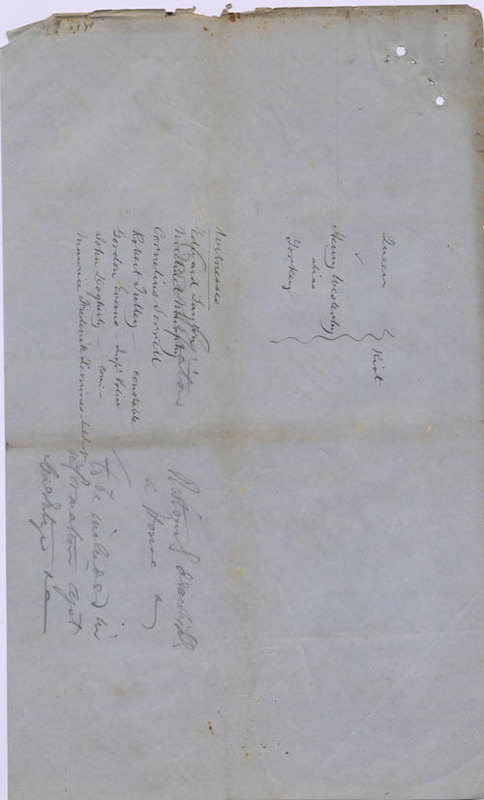 J.B. Humffray, Black and Kennedy, representing the Ballarat Reform League demanded the release of these prisoners on 27 November. It was a fatal mistake, as the use of the word “demand” strengthened Governor Charles Hotham’s resolve for control. Sometimes John Westoby is incorrectly confused with Henry Westerby. ↑ Research by Gabrielle Thomson, 2018. This page was last edited on 29 October 2018, at 00:55.